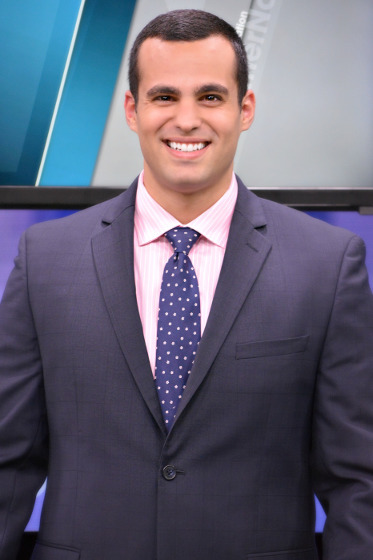 Nick Merianos became part of the WeatherNation team in June, 2016. Before moving to Denver, Colorado, Merianos worked as a weekend meteorologist/ reporter in Binghamton, NY at WBNG-TV. Merianos was born and raised in Middleboro, Massachusetts, located just south of Boston. This is where he developed a love for weather at a very young age – by age six. Growing up in Massachusetts, Merianos developed his passion for meteorology after severe thunderstorms rolled through his back yard multiple times during the summer of 1998. This is when his most vivid and terrifying moment in weather occurred, in his back yard. A strong thunderstorm was approaching his neighborhood when a severe thunderstorm warning was issued. Nick’s mother went outside to put his childhood toys under the deck to prevent them from blowing away. As Nick stood in the doorway, he watched a landspout form across the street and race down the driveway toward his mother. Nick recalls screaming at the top of his lungs in fear that his mother would have been hurt. Fortunately, his mother wasn’t injured by the storm and Nick became hooked on weather ever since. After years of thunderstorms and major New England winter storms, Merianos decided to take his passion one step further in middle school by getting a Davis Vantage Pro II weather station. This is when Merianos decided to submit his local temperature, rainfall and snow totals to the local Boston news stations. Merianos served as a weather spotter for the local media through high school where his reports would frequently appear over the air. He had the opportunity to meet several Boston meteorologists, who mentored him as he began his career. He later interned at three Boston stations, NECN, WFXT and WHDH in college while studying Atmospheric Science. In addition to his love of weather, Merianos loves giving back to the community. He has served as an volunteer firefighter during his four years in college and two years in New York. Merianos graduated the Vermont State Fire Academy with his fire fighter certification in 2014. Merianos also earned his certification as an EMT in college where he served as an EMT. On a fun note, Merianos enjoys the outdoors, especially hiking, snowmobiling and relaxing by the ocean. He has already fallen in love with the Rocky Mountains and plans on climbing numerous fourteeners. Moving forward, Merianos hopes to grow as a meteorologist and advance his career. He is excited to be a part of the WeatherNation team where he is eager to watch the company grow.